Internationally renowned pianist, Volodymyr Vynnytsky, is laureate of the Margueritte Long-Jacques Thibaud International Piano Competition in Paris. Vynnytsky has performed with leading orchestras and appeared in solo recitals in many prestigious concert halls, including Carnegie Hall, Weill Recital Hall at Carnegie Hall, Merkin Concert Hall, Steinway Hall, the Phillips Gallery in Washington D.C., the Great (Bolshoi) Hall at the Moscow Conservatory, the Theatre Champs d’Elysees, Amphitheatre Richelieu de la Sorbonne, Salons de Boffrand de la Presidence du Senat in Paris, St. John’s Smith Square in London, Philharmonic Great Hall of Columns (Kyiv), Odessa Philharmonic Theatre in Ukraine, Tsai Performance Center (Boston), Teatro de Santa Isabel in Recife, Brazil, Linder Auditorium in Johannesburg and Baxter Theatre Centre Concert Hall in Cape Town, South Africa among many others. Described by critics as possessing “incredible technique and deep musical understanding”, “The pianist is simply superb!” (American Record Guide), Volodymyr’s recent performance in Charleston, South Carolina earned him a glowing review in The Post and Courier, titled, “Ukrainian pianist delivers excellence”, in which his playing is hailed as “a grand display of skill and precision that was breathtaking”. Born in Lviv, Ukraine, Volodymyr Vynnytsky studied at the Lviv Music School for Gifted Children and later at the Moscow Conservatory. 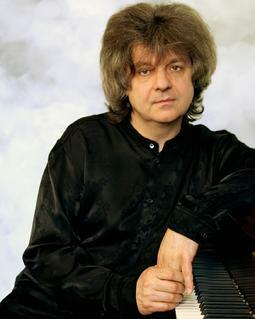 After earning his doctorate from the Moscow Conservatory under the direction of Yevgeny Malinin, he taught at the Kyiv Conservatory and concertized extensively throughout Ukraine, the other republics of the former Soviet Union, Europe, the USA, Canada, Central and South America and South Africa. Volodymyr Vynnytsky has been a visiting member of the piano faculty in SUNY at Purchase, NY and at the University of Connecticut. In 2003 he was appointed Music Director of the Music and Art Center of Greene County, New York. He is an Honorary Professor of Lviv State Academy of Music, Odessa State Music Academy and Tchaikovsky National Music Academy of Ukraine (Kyiv Conservatory). Vynnytsky is Director of Chamber Music at the College of Charleston, Charleston, SC. Works by Volodymyr Vynnytsky available from Duma Music, Inc.
"The idea to write down my piano improvisations arose during the annual 'Music at Grazhda' festival, amidst the picturesque Catskills, near the town of Hunter, NY, where I was 'pianist-in-residence', and eventually became Artistic Director of the festival. It was there that, as fate would have it, I met well-known architect Oscar Newman, a highly cultured and educated gentleman, who enthusiastically supports the arts in this region, and in particular, 'Music at Grazhda'. I had often visited him at his home, and in the evenings, in a private setting, improvised at the piano. At one such occasion, Mr. Newman asked me if I would write three short pieces to commemorate the 150th anniversary of the town of Jewett, NY, where 'Music at Grazhda' is held. I agreed, but skeptical as to whether this endeavor would actually be realized, eventually forgot about the project. Until one day, unexpectedly, a letter arrived at my New York City address – an offer of a commission from the town of Jewett, NY to write the three pieces that Mr. Newman had referred to some time ago. And thus, illusion became reality. Two months later, I wrote 'Lost Tango' and 'Samba' for piano trio, and 'Hilling Leaf' for soprano and piano trio. 'Lost Tango' was subsequently performed in several countries, and in 2011, recorded on Centaur Records. I would like to thank the publisher, Oles Kuzyszyn, and cellist Natalia Khoma, who continually prodded me to finalize the three versions of 'Lost Tango', and were instrumental in realizing their publication". All content ©2009 Duma Music, Inc.